Turn plain saltine crackers into flavorful party crackers to use for all occasions. These crackers are the perfect stand-alone snack or as a tasty addition to your favorite meal. 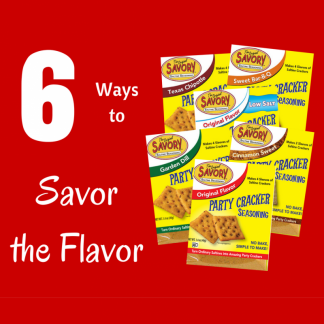 The Savory Saltine Seasoning is sold in easy-to-use packages and allows you the opportunity to make amazing party crackers at home. Everything is made in a 2-gallon plastic resealable bag with only three ingredients: Savory Saltine Seasoning, canola oil, and saltine crackers. There’s no prep, no baking, no mess! well. Add four sleeves of Premium Saltine Crackers. Seal bag with lots of air in it. Form a log or a ball. Coat with chopped nuts, bacon, shredded cheese or cracker crumbs. Roll into a shape to celebrate certain occasions – football, pumpkin, egg, heart shape.